In Nordhorn in Germany near the border with Holland, poor Hans-Christian Rieck has broken his foot working on his organisation’s tjalk named Jantje. Having broken my own ankle last year he has my heartfelt sympathy, and I can only hope his recovery is rather better than mine has been. 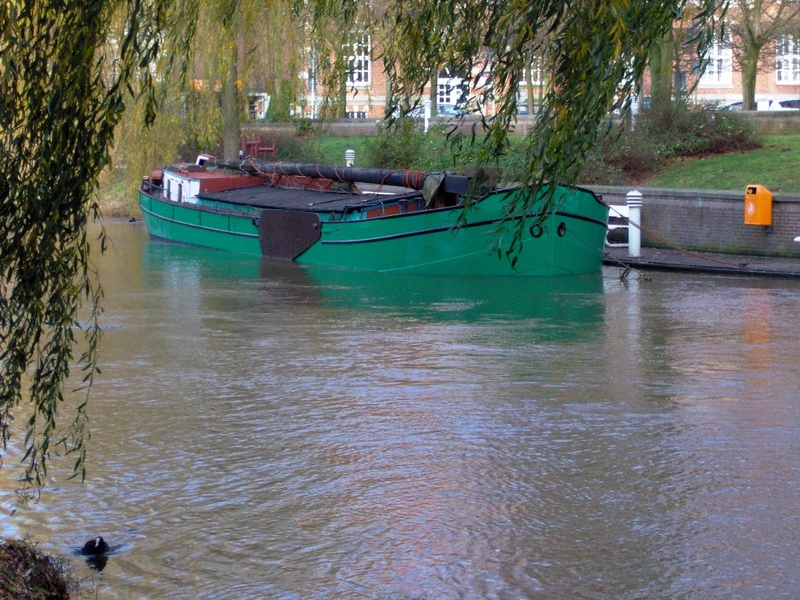 ‘Jantje is one of the Dutch Tjalks, in this case of a subtype called Steilsteven – it’s equivalent in England would be the Thames barge. ‘She was built in 1923 at Delftzijl on the Dutch side of the River Ems estuary and worked the Frisian Lakes until the 1960s, when she was laid up, being to small and to slow to be competitive. Sadly neglected, she spent 30 or so years on a mooring at Makkum on the Ijsselmmer. 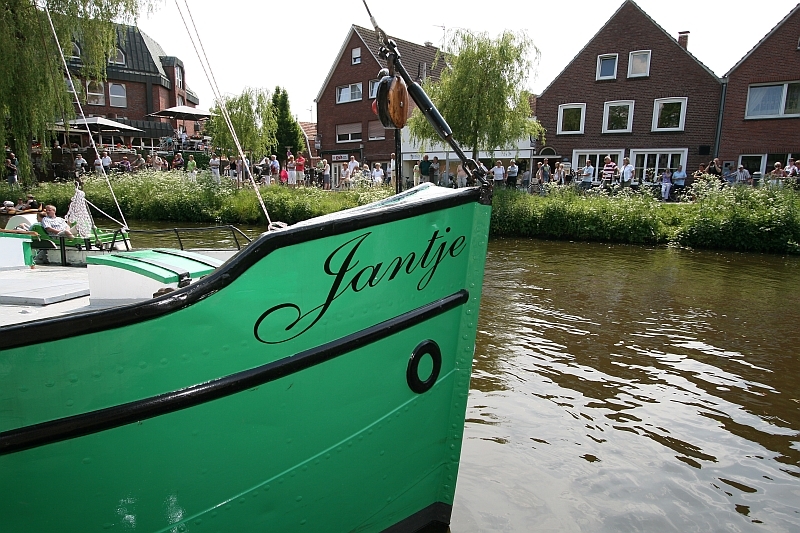 ‘Fortunately, some businessmen of our town Nordhorn came upon the idea to aquire a historic ship as a reminder of the glorious maritime past of our city, and when the treasurer of our association and myself were asked to find a suitable craft, we found Jantje. ‘She was bought, sandblasted, sprayed and then fitted out with an advanced system of ballast tanks to enable her to enter the city, as in recent times our city fathers have built bridges with very limited headroom over our canals and rivers. ‘The ship now floats at a jetty by the old town port and will frequently leave her mooring for special maritime events in our area. 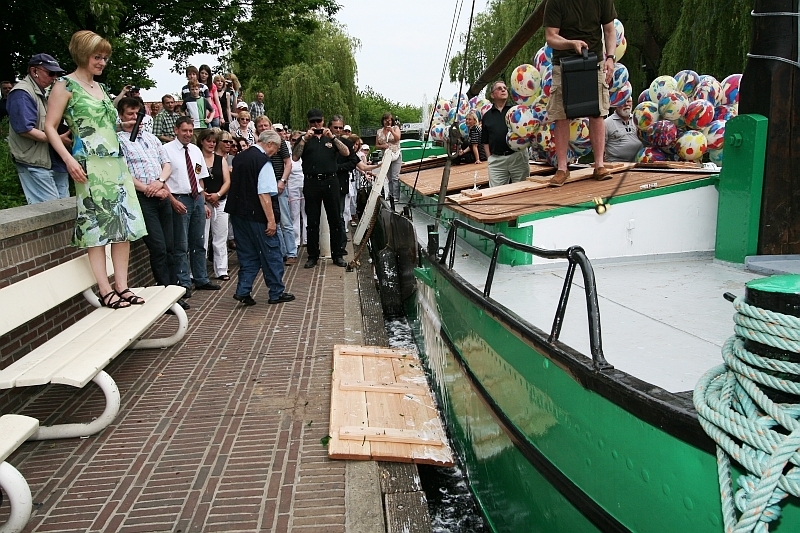 ‘I’ve added some photos of the renewed boat’s christening – the guy with the crutches is me by the way! Many thanks Hans-Christian! I look forward to hearing more in the not too distant future. Be interesting to see a detailed post on the tanning too. 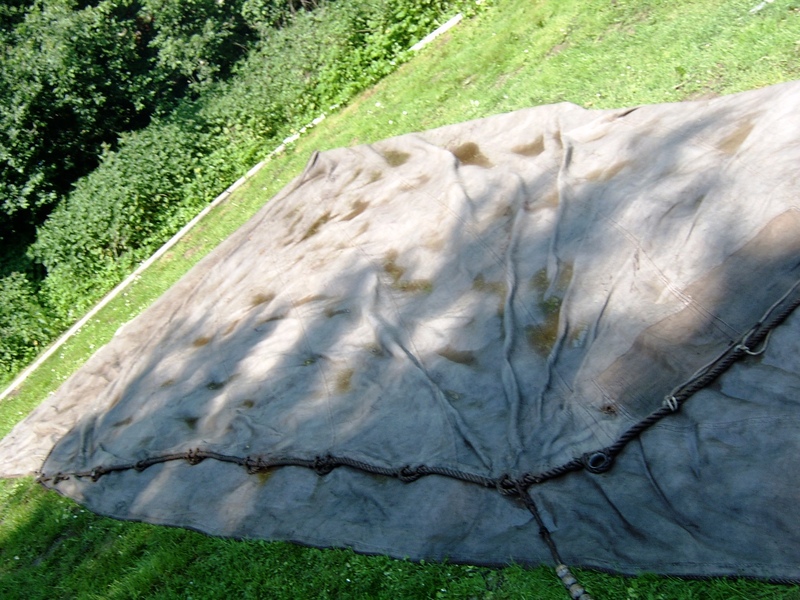 "tanned Jantje’s sails the traditional way with the help of Hermann Ostermann,…how to tan a cotton sail the proper way"
Would it be possible to contact Hans-Christian or herman Osterman for the tanning process/recipe? Or is there another source of info for this? I am endlessly fascinated by traditional Dutch sailing vessels. It's great that you have restored the old girl. I hope she has a long and pleasant life. Hermann has a report on sail tanning in the 25 yearjubilee edition of the South West Maritime Historcal Society (I hope I got that right). I just asked him if he could write something on tanning for intheboatshed.net. You can get in contact with Hermann via Gavin. Oh and by the way, Nordhorn is in Germany, but it sits right on the border to the Netherlands(from my house it's five minutes). We have strong links to them, Nordhorn being from the middle ages till the early 19th century one of the largest ports in North-West Germany trading with Holland via the River Vechte. And funny enough, throught the reign of the House of Hanover Nordhorn was a part of England. There is even a village close by named Georgsdorf to honour George the IV staying there one night on his journey to Hanover in the 1820ies. Brian, John – I gather from Hans-Christian that the sails were stored in Jantje's hold. However, Mr Ostermann apparently knows where to get cotton sails as well as the stuff to tan them. I'm hoping to hear from him at some point, so perhaps we can get your questions answered. I've some good photos of Hermann tanning his sails in Nordhorn in 2009. It seems it's only him although I do remember fellow herring smokers Rene and Bart, from Holland, boiling up some tanning solution at Brest in 2000. 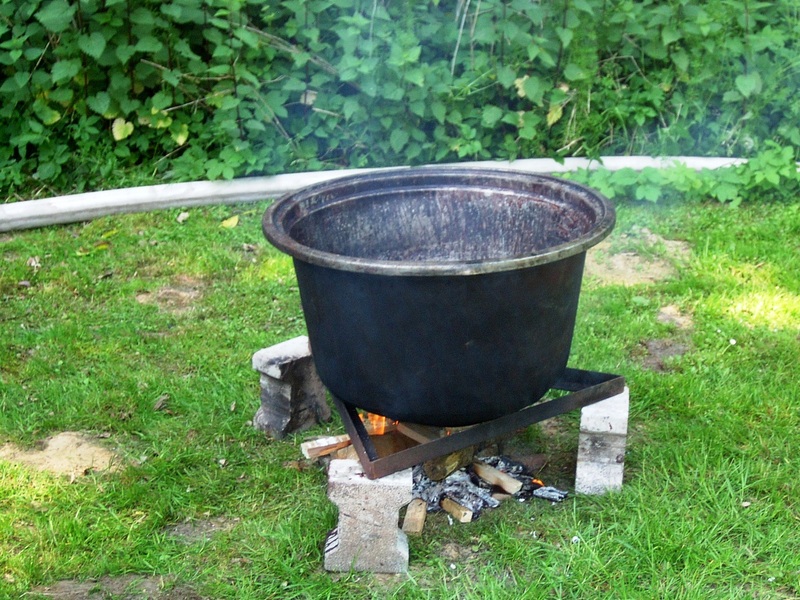 I put one of my cotton smocks in ands it still has the colour after several washes to rid it of the herring smell. Hermann has a history of textile dying and knows what he's doing. He sent me a box of Quebraco (I think thats how you spell it) several years ago which we used but I gave the remains away a few years ago. Try buying cutch these days………if anyone knows the whereabouts of a box of the cutch used by fishermen a century ago, please let me know. It looks like treacle toffee it's so brittle and dark. Comes from the Acacia tree of India and is full of tannin. By the way Hans-Christian, you are right, Hermann's long article is in the South West Maritime Historical Society's journal from last year. Hope the face isn't too painful……. Is this available on the web anwhere? Or could anyone email a copy? I'd be interested in seeing the article too. Here in France for the sails on the traditional Loire river boats, futreaux and gabarre, toué etc, they use cotton canvas, which works well enough for the simple square sails that they use when the wind is aft, but it stretches too much. during my apprentenceship as boatbuilder on the Gerdes boat and shipyard in Varel I came one day to chat with my boss, master shipwright Heino Gerdes, about the flat-bottomed sailing boats of the Waddenzee(Dutch) or Wattenmeer (German). He had the firm believe that in the hand of an able sailer one of the these ships would sail faster than any other. He than recalled a story of his youth in the early sixties, when during a race with tjalks he sailed on one with cotton sailcloth. What they did was to nail the cloth to the boom to counter the stretch! To my obvious astonishment he said that they didn't mind, because it was just for time of the race. Naturally he claimed their ship to have won the race. Nowadays we have the sails glued together, they will never ever rot, they don't stretch and are light-weight and easy to handle. But the craftmanship ist getting lost and the knowledge to work with natural stuff. So it is very important to have people like Hermann and I can only hope that there are folks around who are willing to carry the staff further to the next generations.